I have a really fantastic new book to tell you about today. In fact, it’s one of the most beautiful books I’ve seen in a long time. Just look at it. Don’t you just want to grab a mug of something hot and curl up with it on the sofa? Chances are you’ve heard about this book already, particularly if you’re a dedicated reader of food blogs. That’s because the author is one of our own—the incredibly talented Béatrice Peltre, better known as La Tartine Gourmande. But Béa hardly needs any introduction from me. 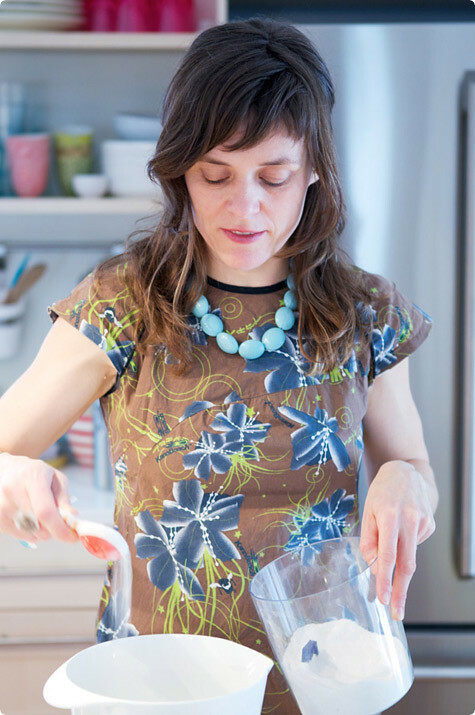 In the years she’s been blogging, her site has become one of the best-known (and loved) out there, receiving numerous awards and helping launch her career as both a food writer and photographer. One look at her site and it’s not hard to understand why. Her food is elegant and imaginative, and her big, luminous photos tease out the beauty in everything they capture. And then there’s Béa herself, one of the nicest, most down-to-earth people I know, not to mention one of the most energetic and endlessly creative. 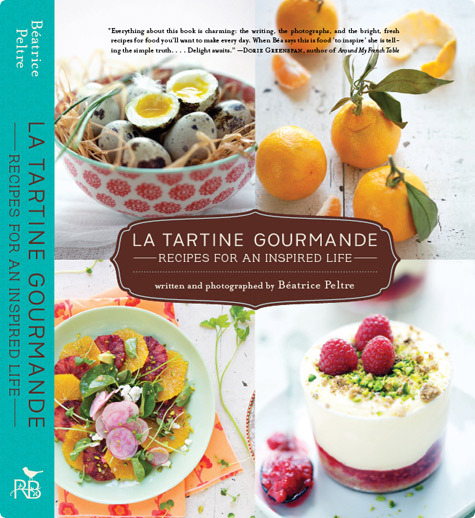 Her brand-new book, La Tartine Gourmande: Recipes for an Inspired Life, captures everything I love about Béa and her site. It’s unbelievably beautiful, chock-full of her gorgeous photography that makes you want to just lift a spoon off the page and dig in. Her writing revolves around her life in Boston, her family and her travels, but my favorite parts are those about her childhood in rural France, where between kitchen, orchard and garden she learned to value natural, seasonal food. This affinity shines through in her recipes, which effortlessly strike a balance between simple and sophisticated. 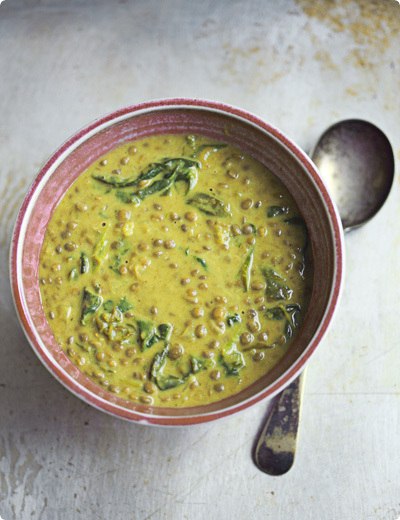 A lot of her dishes have French pedigrees (including her namesake tartines) but they always carry her unmistakeable touch: an unexpected vegetable, a surprising spice, a more wholesome grain. Fruits and vegetables are given center stage, but it only dawns on you later that the book is nearly vegetarian—not to mention gluten-free, utilizing things like millet, quinoa and amaranth to build tender tart crusts and delicate cakes. I asked Béa to select a recipe from the book for me to share with you here. The one she chose, I think, sums up the feel of her book perfectly. 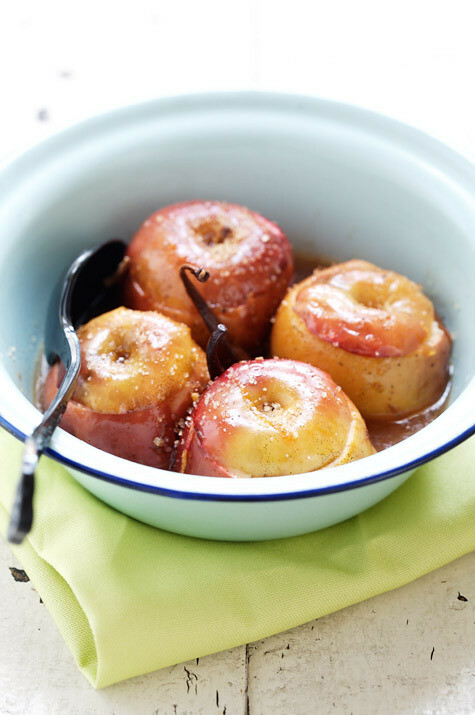 In it, she’s taken something familiar and even a little mundane—baked apples, in this case—and lifted them almost beyond recognition with an exotic nut-and-fruit filling and a fragrant syrup perfumed with vanilla, olive oil and spices. Imagine your favorite comfort food took a trip someplace exotic and came back just that little bit more worldly and sophisticated—that’s how these apples taste. She suggests serving them with yogurt as a light dessert; my advice is to double the recipe and have some for breakfast too. But wait, that’s not all! Béa’s publisher has also very kindly offered me an extra copy of her book to give away. Just leave a comment (including your email address, so I can contact you) anytime between now and next Wednesday (March 7th) at 9pm CET, and I’ll enter you in the drawing. And before you ask—yes, it can be shipped anywhere in the world! Béa wrote me this about the recipe: “I grew up in rural France with apple picking as one of my favorite autumn food traditions. At home, from my grandparents, aunts and uncles, to my parents and brother, everyone had at least one apple tree in their back garden. 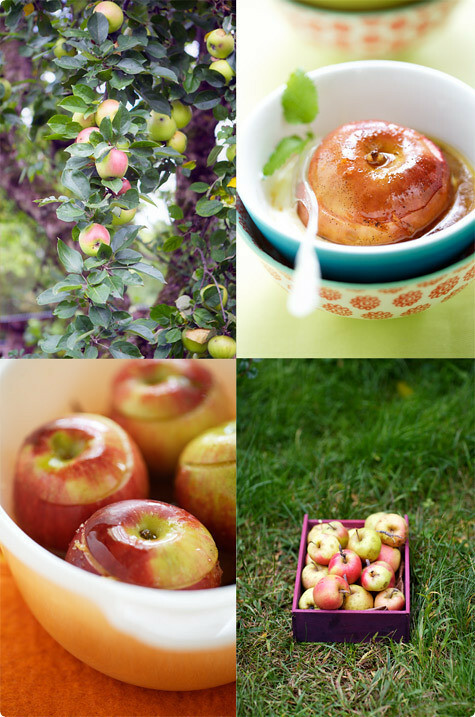 Every year, when September came and the fruit was ripe, we’d fill buckets with apples to make apple tarts and compotes (apples stewed). Apple naturally became a favorite fruit of mine, and so were baked apples. In a small bowl, combine the cranberries, pistachios and almonds; set aside. In a pot, combine the apple juice, lemon zest, vanilla bean and seeds. Bring to a boil, then remove from the heat. Cover and leave to infuse for 30 minutes. Preheat the oven to 350F(175C). Core the apples, then slice the top off each one (set these aside) and drizzle with lemon juice. Place the apples in a baking dish and divide the stuffing mix among them. Place a cinnamon stick in each apple and cover them with their tops. Pour the infused juice and the oil over the apples and sprinkle with sugar. Place the apples in the oven and bake for 1 hour, or until the flesh is tender, regularly drizzling with the cooking juices. Remove from the oven and serve warm with the juices and plain yogurt on the side.